I believe there is some sort of made-up word for when you go to get a snack from the refrigerator, and you can’t find anything. However, you still go back to it, as if something will materialize. Of course, you realize that it costs precious energy and money to stand in front of an open refrigerator door. So why not make it transparent? This conceptional refrigerator by designer Yoon jung Kim and Jong rok Lee has some special glass in it that is normally opaque. However, if you run a current through it, it will turn transparent. I’m not at all certain if this will work, as I have never seen glass like that before. I’m not doubting that this could work, but if we have glass that can go from transparent to opaque, then we really need to use it on more than just refrigerators. In addition to that glass trick, this Window Fridge has another outstanding and unique feature: sections. That’s right, this refrigerator doesn’t just have one or two doors, but many. So if you want to categorize your foods, and sort them by the five compartment doors, then you can. Well, there is no word when this fridge is going to be actually made. Perhaps the designers need to perfect this glass going transparent or opaque thing. Singapore uses that kind of glass for its Light Rapid Transit trains, when the train gets too near the housing estates, the glass turns opaque to maintain the privacy of the residents. Actually, the glass going transparent or opaque already exists. The real problem to me would be keeping all those seals around the smaller doors in shape. As most people know, though, the real trick is to have a refrigerator or freezer that can steal room from one side or the other whenever you have something that is wide to put into it. THAT plus the clear doors would be a really cool thing. 1.Why are you associated with Coolest Gadgets? 2.Electrically charged glass that can become opaque has been around for years and its been in use for years. 3.Numerous companies produce it. A quick Google provides you with one called electricglasswall.com and there are others. 4.The bigger question is why does one need opaque glass on a refrigerator door in the first place. Glass refrigerator doors have been available even longer than electrically charged glass. Where do you live? Omaha??? 5.A non-news item about the future from someone who doesn’t even know what is going on today. Agreed Ron, I have questioned the knowledge base of some of the writers here for some time. Brilliant concept but I wish them luck in finding a combination of glass that can turn opaque and also has the necessary insulating properties a refrigerator door requires. Still, I wish them luck – one of the oft repeated energy-saving tips for the home is to decide what you want before you open the fridge. This would certainly help people with that. It’s a great idea, I wonder when they will become commonplace? 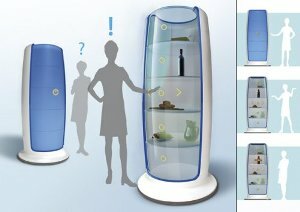 I would purchase one, in saying that however it would be depressing looking in if the fridge was empty! !